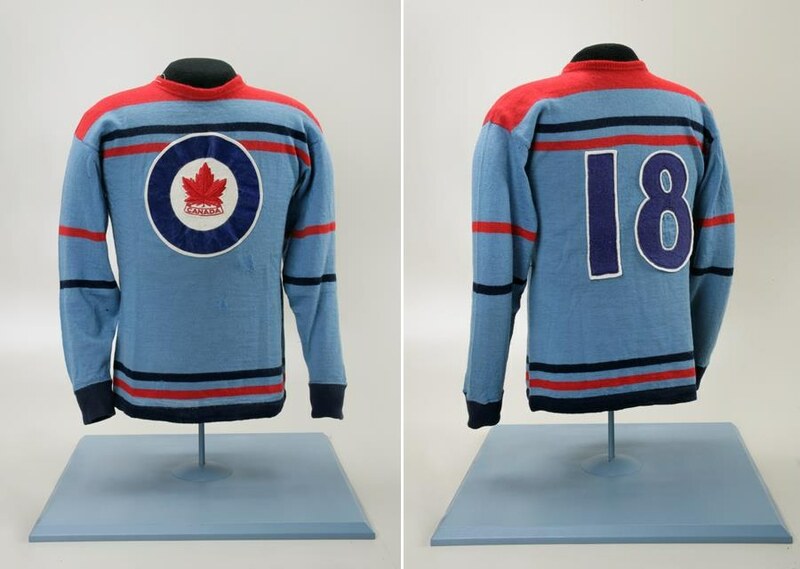 The RCAF began a nation–wide search for players on October 17, 1947, a scant 3 ½ months before the Olympic Games and 2 ½ months before the team was to depart for Europe! It is the tight timeline of team candidate identification, selection, and conditioning and training as a "team" that is one of the most remarkable aspects of this story. For approximately 1 month initial auditions were conducted across the country. In the end, about 200 airmen were dispatched to Ottawa for a training camp in October, 1947. This initial group was quickly pared down to approximately 40. Frank Boucher later commented that the volunteers were mostly a sad–sack lot, a shock for both Watson and Boucher. Some could barely skate. Boucher was to find some gems amongst the recruits and Boucher specifically mentioned to the media: Gilpin and Brooks. 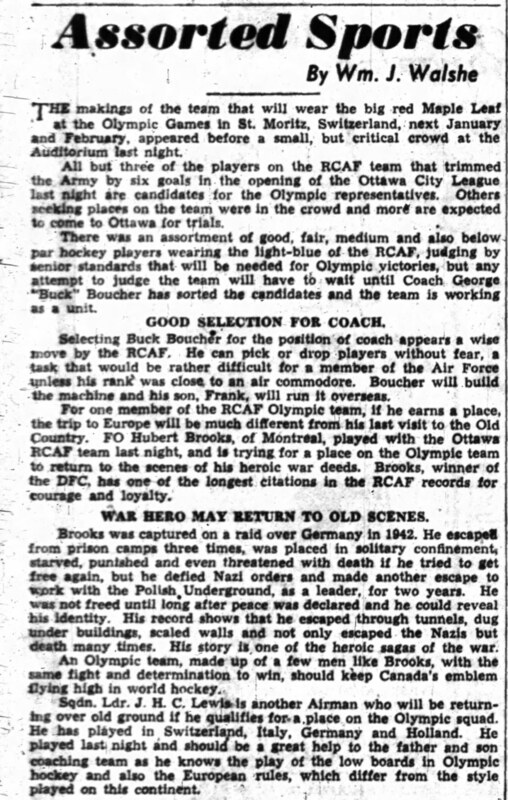 Before George "Buck" Boucher was appointed Team Coach in Canada, Air Commodore MacKell was making strong statements to the press as to how confident he was that the RCAF would produce a winner at St. Moritz. I made MacKell's "possibles list" and was known from my hockey play with the US Army AllStars in Europe the year before and was asked by the RCAF to audition. I was both surprised and pleased. I’d played hockey seriously in Montreal during high school with considerable success and several line mates and opponents had gone on to NHL careers. But the war had stopped my hockey development. The US Army Allstars was fun but it was frankly more high–end recreational hockey. My team mates had continued to hone their hockey skills playing junior hockey etc and some had Allen Cup / Memorial Cup experience. Nevertheless when my bosses at AFHQ in Ottawa pointed the opportunity out to me I responded to the call and was willing to see where the chips would fall. Cpl. Frank Boucher,of Alymer P.Q. and son of George Boucher and former professional player with Philadelphia and Providence, would carry on as coach for the time being. 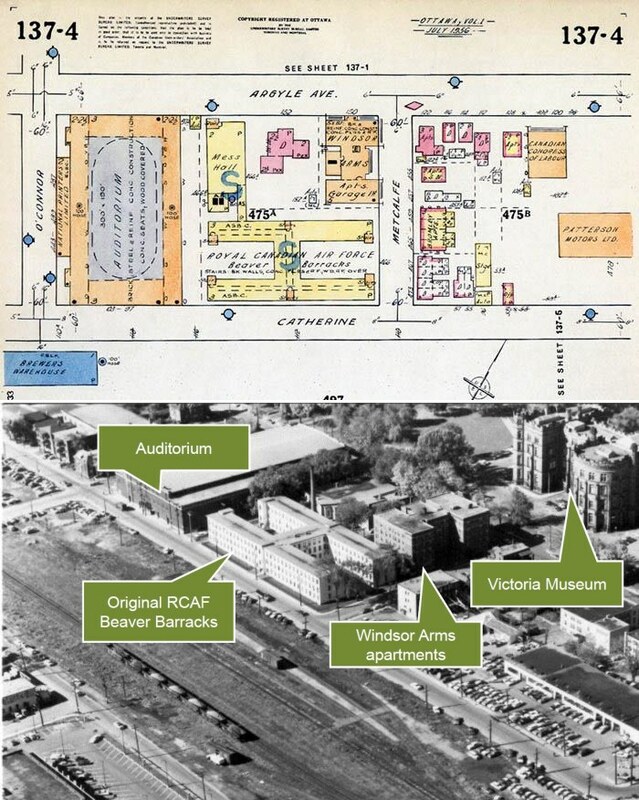 The 1st practice was on Monday October 20, 1947 at the (Ottawa) Auditorium (ice rink). The team at that stage was comprised of members of the RCAF (Ottawa) City League team (also called Central Command) being coached by S/L Harry Lewis as well as prospective RCAF players who had arrived from outside the Ottawa region (Eastern and Western Commands) since the cross-country appeal had been made. Two complete teams played in the practice but no effort was made to sort the players. 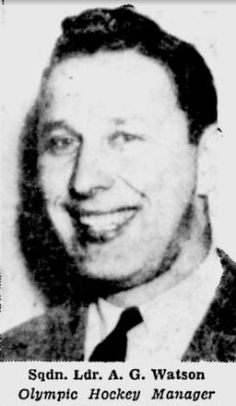 Although a coach for the Flyers had yet to be formerly announced, Frank Boucher would continue to fill in unless a name coach is selected by the RCAF. Flight Lt. Joe McKinnon was appointed as publicity director for the RCAF Flyers - this would turn out to be an enormously popular move with the press as Joe was to do a truly excellent job. The plan was for the players to practice daily living conveniently at the Beaver Barracks (also known as Princess Alice Barracks) on Catherine Street right next to the Auditorium. In addition to 9 new players from the Western and Eastern Commands arriving for team tryouts today, this was our 1st game as an "olympic team in making" versus the Army in the Ottawa City Hockey League. 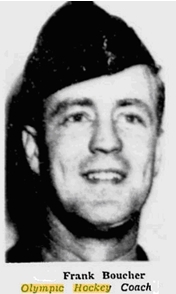 During our first game against the Army, Frank Boucher, a former professional hockey player with the Philadelphia Ramblers and Providence Reds before joining the RCAF in 1940, acted as a player coach and frankly was pivotal in the win setting up plays in all three periods and scoring a pretty goal in the second period. Stan Rooke another former professional who would not qualify for the olympics also had a good game. At this point in time members of the eventual Olympic RCAF Flyer Team who were amongst the prospects being considerd consisted of: Louis Lecompte, Irving Taylor, Patsy Guzzo and myself. 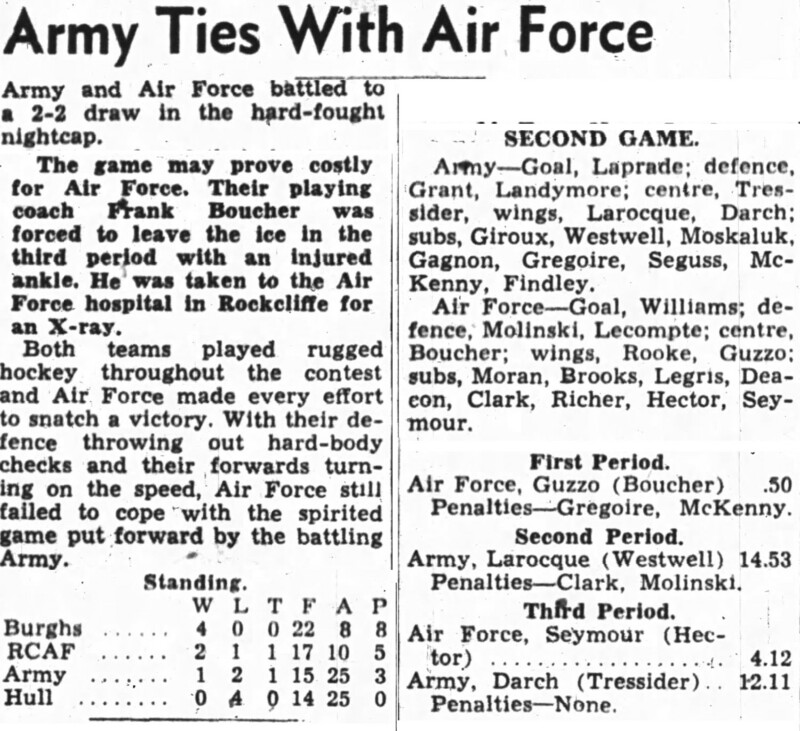 The sports journalist comments on the quality of Flyer play during the game against Army the next day (see below right) were universally lukewarm however rationalizing that Buck Boucher had yet to engage in sorting the team out and this was early days. Buck had watched the Airman from a box seat at the Auditorium and only visited the team during one of the intermissions leaving his son Frank, at least for this night, to act as player-coach. 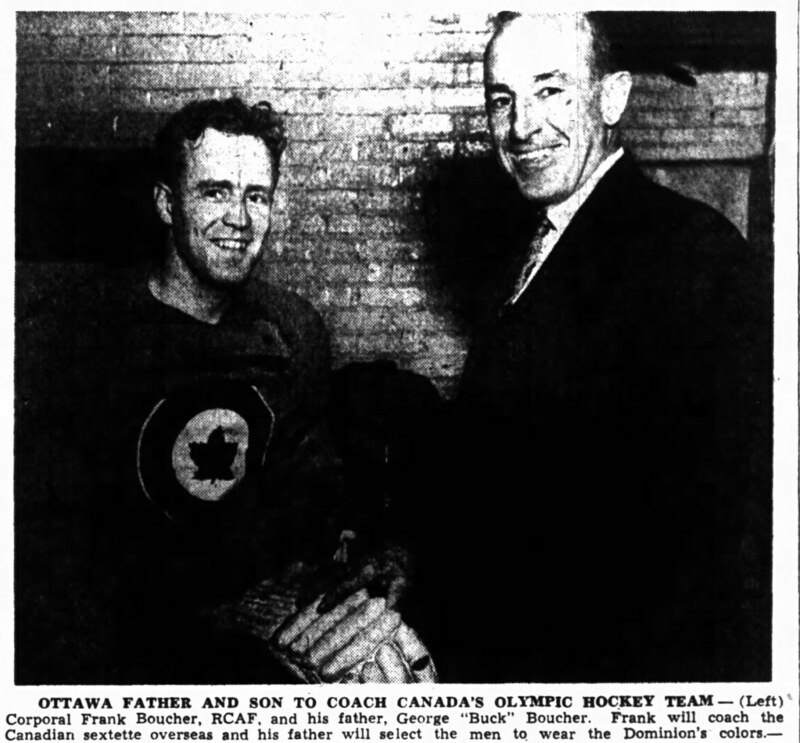 A number of newspapers ran front page photos of the Tuesday October 21, 1947 formal announcement by Air Marshall Wilf Curtis that George "Buck" Boucher had been appointed Team Coach in Canada and ultimate responsibility for team selection (while at the same time retaining his job at the QSHL Senators). Buck was to work closely with his son, Frank Boucher, who would coach the team at the Olympics. George "Buck" Boucher was well known at the time in Canadian hockey circles as the coach of the QSHL Senators and a former NHL all–star professional hockey defense great with Ottawa, Montreal, Chicago and St. Louis. 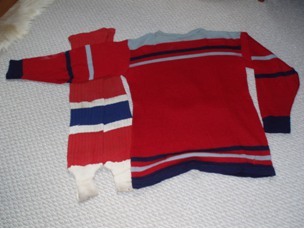 His mentoring of "young Frank" as the Ottawa Citizen stated it, was seen as a shrewd hockey move. Air Marshall Curtis stated that Buck Boucher had offered his services to the RCAF without any desire for financial compensation and made the point that Buck would have a completely free hand in the selection of the players. What would turn out to be the de facto Selection Committee of Frank Boucher, George "Buck" Boucher and "Sandy" Watson started auditioning players. With painstaking precision, the two Bouchers and Watson scoured the land for the best players the R.C.A.F. had to offer. Olympic hopefuls were flown in from bases as far away as Whitehorse, Yukon. 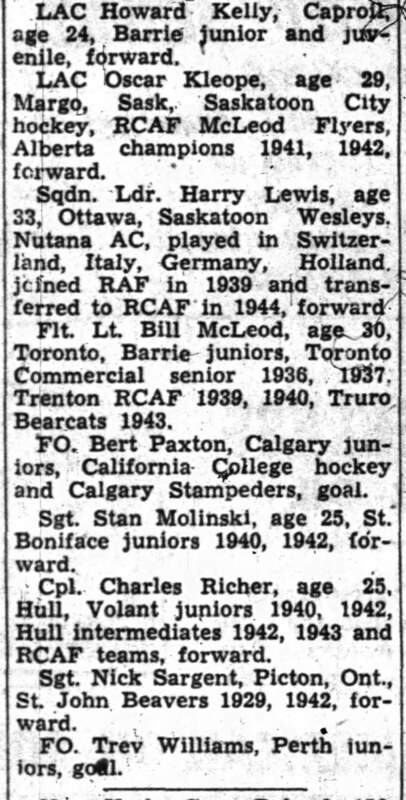 Watson and Frank Boucher had a good knowledge of players from the European military leagues during the Second World War, many of whom had risked their lives in bombing missions and combat. The news headline for the day was that the RCAF Flyers first player cuts were made over the weekend by Buck Boucher of some 11 players from the 38 then in camp. An additional 11 players were due in for a tryout that week. Many more cuts were to be made. Many more players were to try out. Two hour daily practices were now the norm. Buck Boucher immediately started a "new system" with double practices most days. Buck had four lines going in the morning practice and four different lines in the afternoon. Some of the boys worked out in both daily practices where Buck thought it was necessary. Buck was determined to get everyone conditioned and a fair shot at making the team before cuts were made. This night 14 of us dressed for our second game in the Ottawa City Hockey League against New Edinburgh. We lost the game 5-3 to league leading, hard hitting New Edinburgh team. Olympic inelligible, former professional players Frank Boucher and Stan Rooke stood out for the RCAF Flyers. I was able to get the last goal in the third period playing with the line of Boucher and Rooke. I also picked up a penalty in the first period. 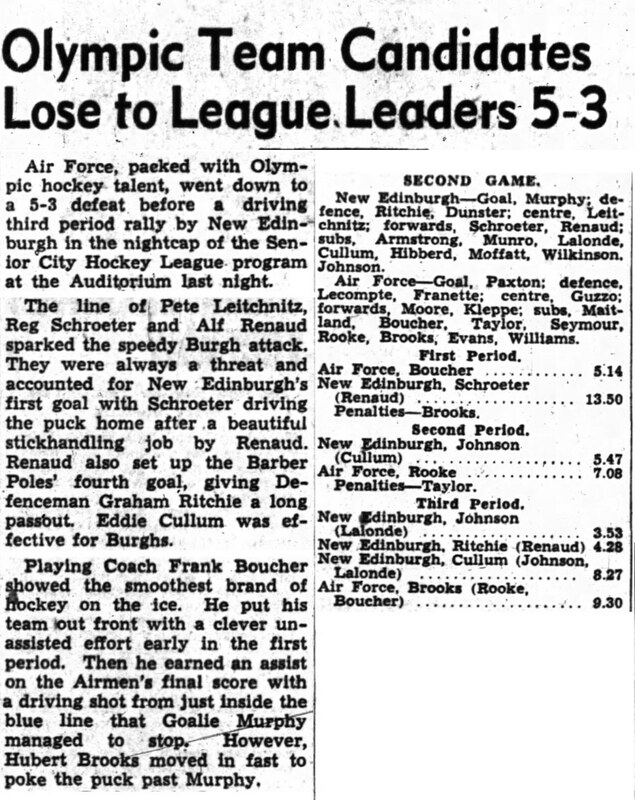 Perhaps an overlooked point is that our coaching staff got to see New Edinburgh players (and future Flyers) Pete Leitchnitz, Reg Schroeter and Ab Renaud up close. On this date the team was shocked to hear that locker room favorite and Flyer goalie-candidate Flying Officer Bert Paxton decided to leave the team after reading the Olympic Oath that all players would have to take, and deciding in all good conscience that he could not honestly take this oath. We were stunned. 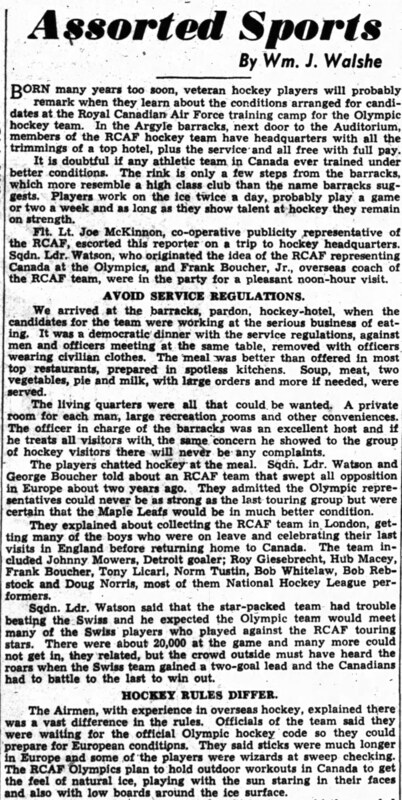 It was also about this time that Corporal George McFaul of Carlington, Ontario, well known Eastern Ontario hockey and football trainer, then stationed a R.C.A.F. Maintenance Command Headquarters, was appointed as Team Trainer. It was also about this time that the Ice Follies came to town and took over the Auditorium, and we spent about 4 days of practice (essentially skating) at the Minto Skating Rink. Between October 28th and November 5th a number of new players had entered camp. Also by November 5th about 18 players that had triedout for the team had been cut. We now stood at 28 vying for positions on the Olympic team, with more players on the way and more cuts to be made. We beat the Hull Volants 4-1 in the Senior Ottawa City Hockey League moving us into second place behind Burghs. Once again our Olympic-inelligible duo of Frank Boucher and Stan Rooke played a key factor in our victory. 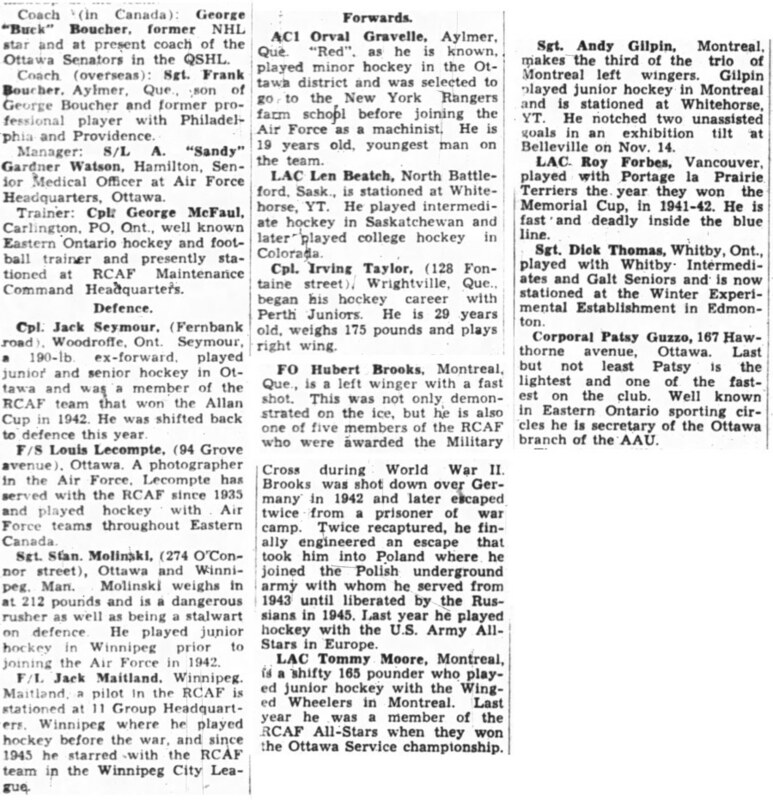 Although the games that we played in the Senior Ottawa City Hockey League were good practice in preparation for the Olympics and allowed the coaching team to audition players, they also "counted" in the Air Force's standing in the Senior City League. 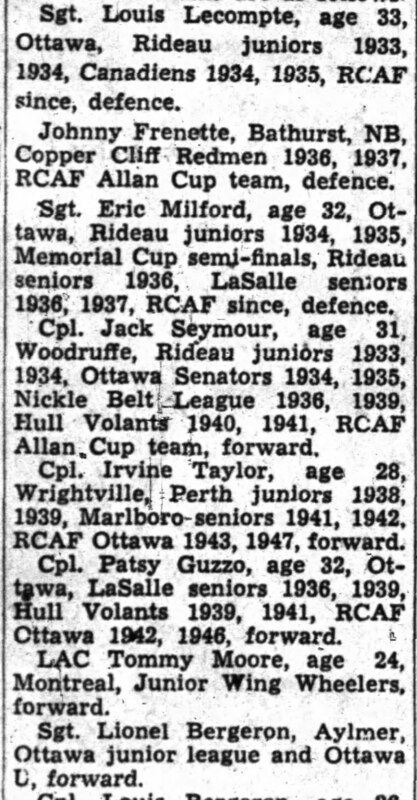 Once the RCAF Flyers departed for Europe, the RCAF planned to replace us mid-season with other Air Force hockey players. On November 12th we tied the Army team 2-2 in a senior Ottawa City Hockey League game. 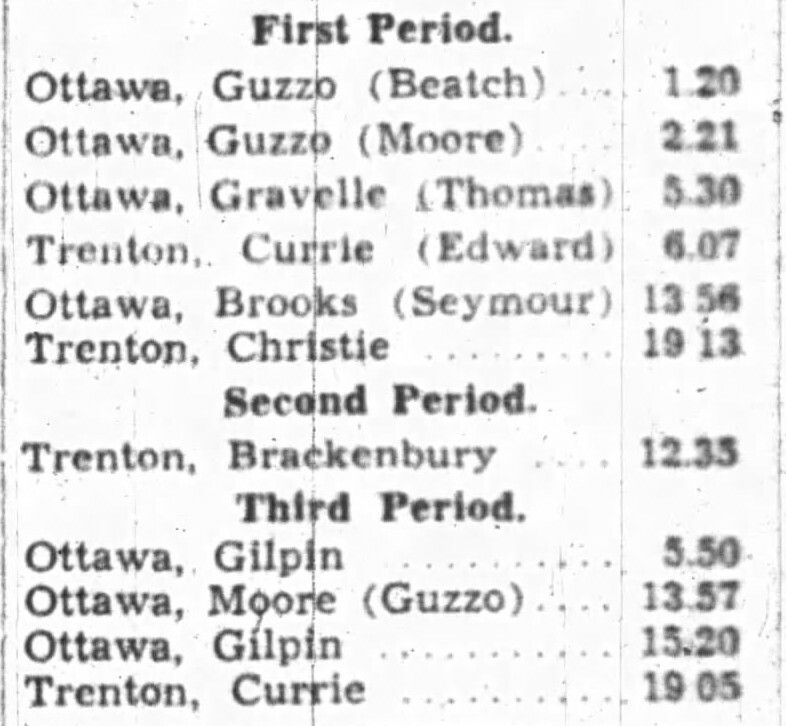 Frank Boucher again was the dominant player on our team until he was injured in the third period. Stan Rooke and Patsy Guzzo also played very well. Buck Boucher was starting to feel more and more comfortable with the team, although the cross-Canada recruitment continued. November 13, 1947 Orval "Red" Gravelle of Aylmer joined the RCAF team today as a candidate for the RCAF Flyer Olympic squad. 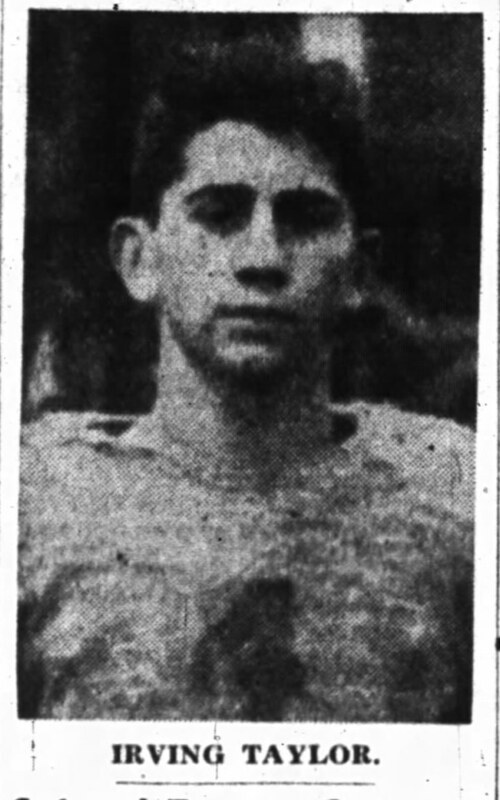 Had been playing with the Alymer Saints Junior team and had been recommended by Aylmer's coach , Bill Boucher, brother of Buck Boucher and uncle to Frank Boucher. (Editor's Note: Sandy Watson would much later relish telling the story concerning the recruitment of Orval "Red" Gravelle. "He was a 19-year-old playing Jr. B hockey for Aylmer Saints. Gravelle had been a bellhop at the Chateau and was most remembered around the hotel as the kid who never lost a tip. We moved from Senior Ottawa City Hockey League to a local exhibition game on November 14th with our 1st game in Belleville against the Trenton R.C.A.F. squad. The Flyers won 7–4; with Brooks scoring one goal in the first period. Players Guzzo and Gilpin stood out in this game. New addition Red Gravelle scored a pretty goal. On November 16th we played another exhibition hockey game -- this time in Kingston against Queen's. We beat them 8-5. Flyer goals were made by Beatch and Seymour , who scored two goals apiece, as well as goals by Rooke, Moore, Gravelle and Brooks. These 13 were derived from a total of 60 players auditioned. Names of the regular and alternate goaltenders had not yet been announced and two other players are still to be selected. "This is strictly a tentative selection, and if before the team sails, other players prove to be better than the ones named today, they will be taken to the Olympics." No one could have imagined at this time how prophetic this comment would turn out to be! "The team will have a heavy practice schedule and a series of games will, in all likelihood be arranged by the C.A.H.A. before the team leaves for Europe on Jan. 3. 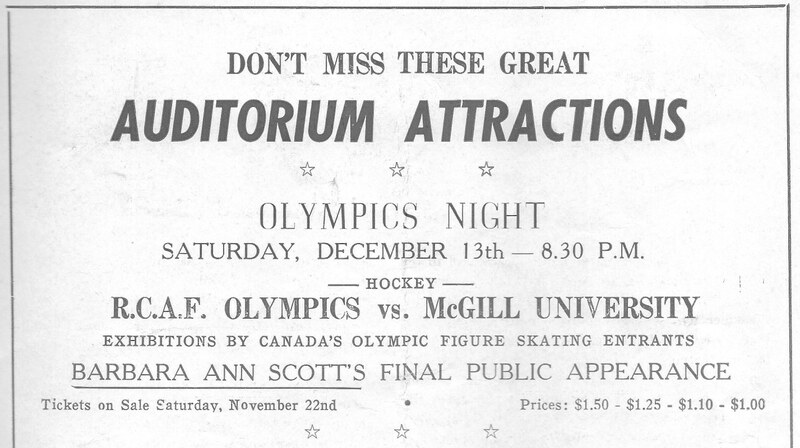 The only game arranged to date will be played on "Olympic Night" Dec 13th at the Ottawa Auditorium against McGill University." 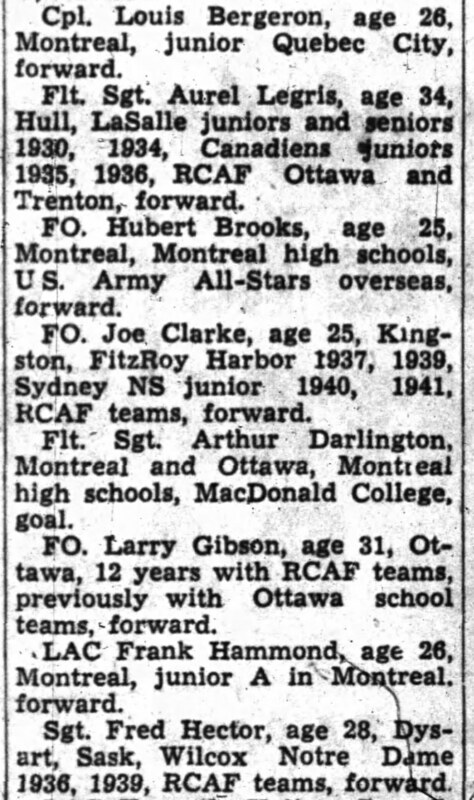 On Nov 24, 1947 Coach Buck Boucher announced that FO Trev Williams of Ottawa and Cpl. Ross King of Whitehorse Yukon were selected for the position of goalie for the RCAF Olympic team. Buck noted that this still leaves 2 places open, which will not be filled until the team is formally named before sailing for Switzerland. Buck re-stated that although 15 members have now been named, changes may be made if other candidates display better hockey. Two quick goals in the final minute of play cost us the game as we went down to a 5-4 defeat against the Hull Volants in a Senior Ottawa City Hockey League Game. This was considered to be a surprise upset. We also lost the services of regular RCAF goaler Darlington who caught a puck in the mouth knocking out 3 teeth and opening a gash in his upper lip requiring multiple stitches. Darlington was then replaced by Trev Williams. 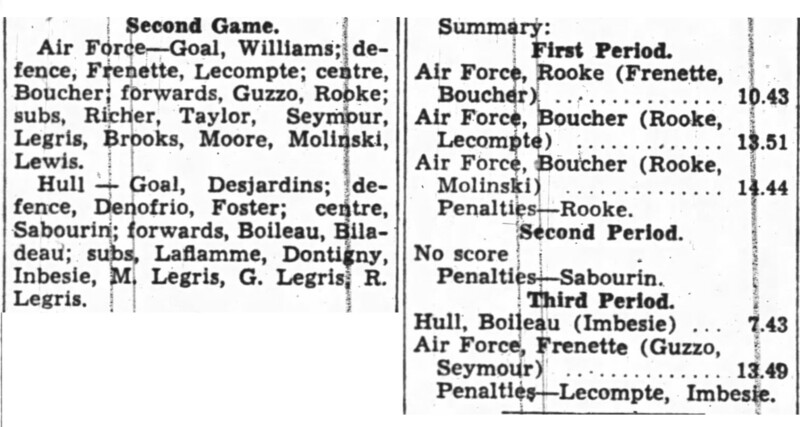 Both Hubert Brooks and Stan Molinski for the RCAF team had 2 goals apiece. Red Gravelle played his usual aggressive game and earned an assist on one of my goals. 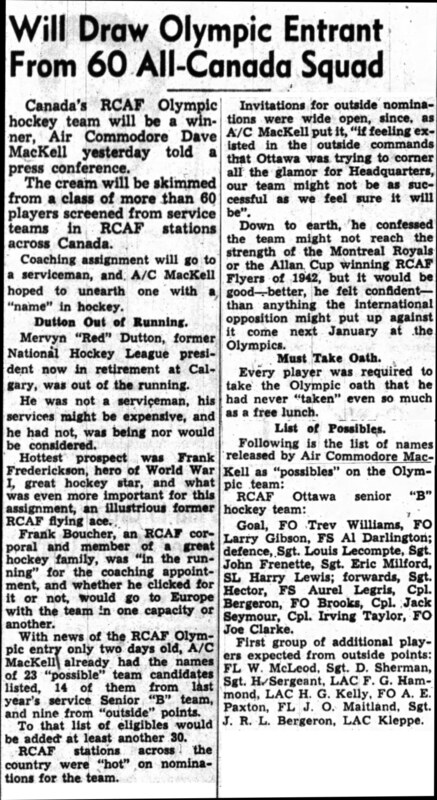 In time for the RCAF Flyers first official appearance against the McGill Redmen on "Olympic Night, Saturday December 13th at the Auditorium, George Boucher announced the tentative selection of the final 2 players for the RCAF Flyer Olympic Hockey Team. They are Cpl Louis Bergeron, a left winger from Montreal and AC1 George Wilson from Regina. This nominally completes the roster of 17 players. Boucher once again emphasized that the team as it now stands may be changed before the January 3rd sail date for Europe. "If any player in the RCAF proves himself better than the men already selected, then that player will replace one of our present ones". 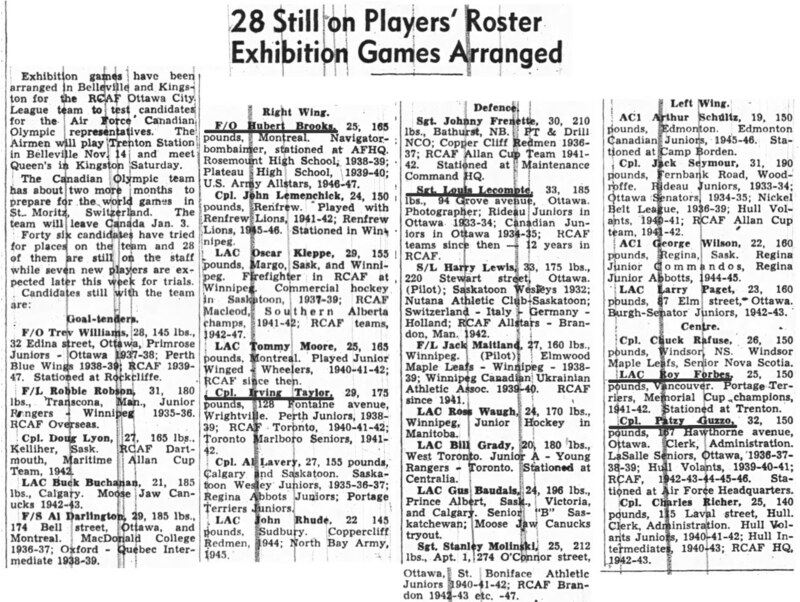 Looking back to this point of time, of the 17 "tentative" players then listed on the RCAF Flyer Team, only 8 would eventually "make" the team at time of sailing to Europe. 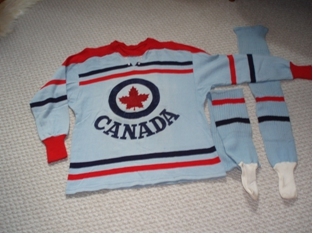 Our game jersey, shown in the photo immediately below, was a pale air force blue with red and black trim with a red maple leaf underscored with CANADA within a circular blue air force logo. 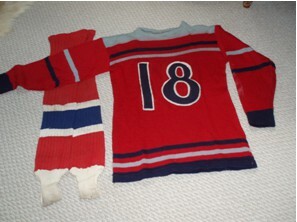 Our practice jerseys were a warm woolen red with black and light blue trim. I would eventually end up with number 18. 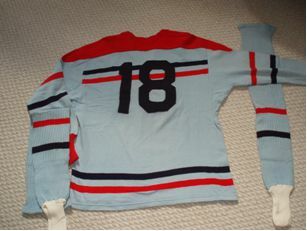 Post Olympics, back in Canada, we got a new jersey, shown in the bottom photo, similar in style to our Olympic jersey but with CANADA more prominently displayed.